This out-of-the-box scheduling solution comes complete with five built-in views, recurring appointments, reminders, labels, data binding, grouping, importing/exporting, and much more. Developing a scheduling app from scratch has never been easier. 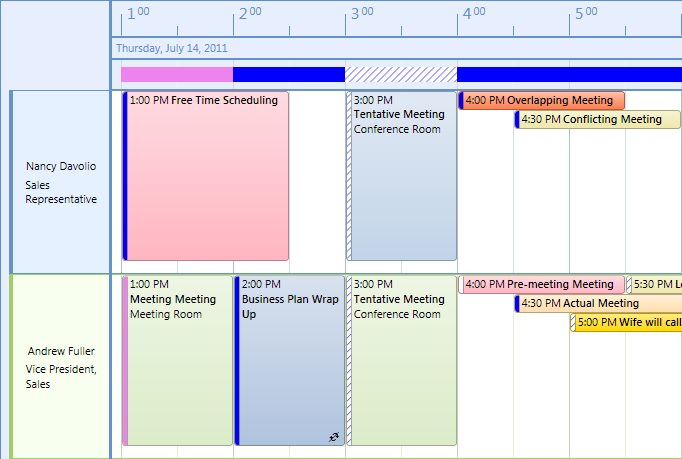 Scheduler provides complete Microsoft Outlook-style scheduling out of the box. Users can create appointments that occur once, all day, or that recur with support for reminders, labels, and availability status. Stay organized with categories, resources, and contacts linked to each appointment. Synchronize Scheduler to the ComponentOne Calendar control to provide seamless date range navigation. 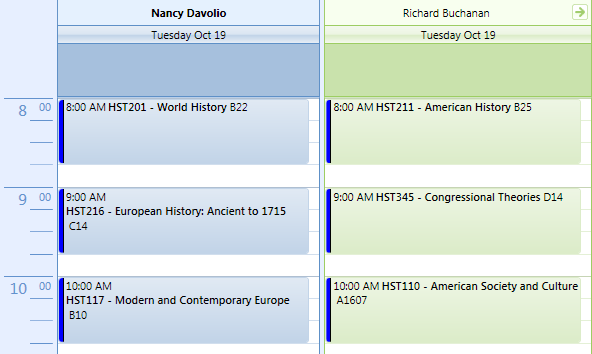 With the Scheduler control's five built-in views, you can offer a variety of ways for users to view their schedules. View schedules by day, week, work week, month, or timeline. 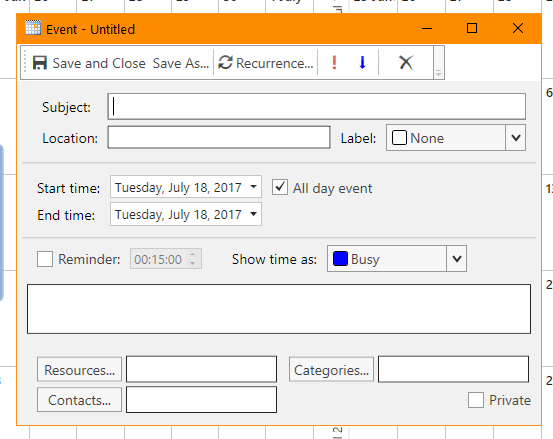 In timeline view, the time is displayed horizontally, and groups are arranged vertically — much like the 'Schedule' view in Microsoft Outlook. The control also supports the creation of custom views. Use standard ADO.NET data binding, custom object collections, or the built-in XML data source to easily save and load appointments, categories, contacts, labels, resources, and appointment statuses. Scheduler supports printing in several different templates. You can also save or load data in any supported formats: binary, XML, or iCalendar (iCal). Group appointments by contacts, resources, or categories to create a multicolumn layout where each column corresponds to a different item. Navigate through any number of grouped items with ease. Simply drag an appointment to reassign it to a different resource, category, or contact. Grouping is supported in all scheduler views. Customize all of the scheduling dialog boxes by using any of the available source XAML files to tweak the layout, style, and logic. Add your own custom data fields, and create your own look for appointments, recurrences, reminders, and other dialog boxes. Scheduler also supports localized resource files for localization, and includes more than 20 different cultures. Choose a quick, built-in Office 2016 theme, or customize your own look and feel for your scheduler. 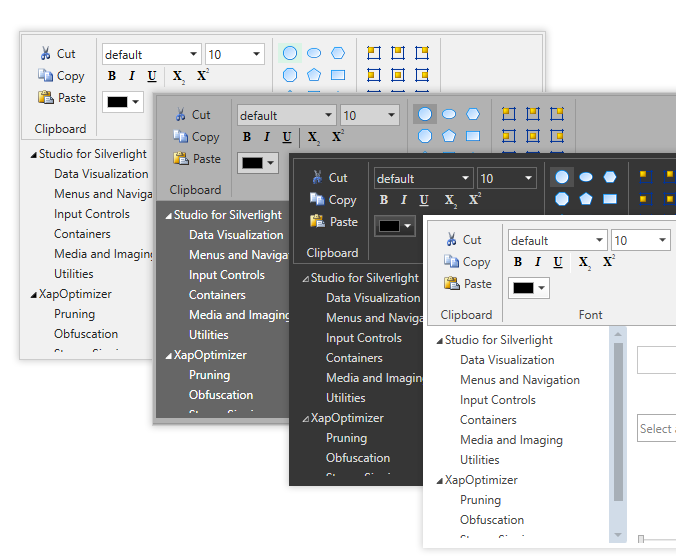 Because of our ClearStyle technology, you can very easily customize the style and appearance of Scheduler and Calendar by setting brush properties in Visual Studio. 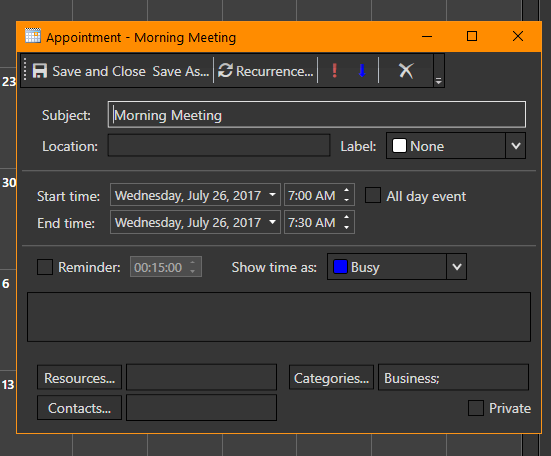 The Scheduler and Calendar controls support several built-in themes, as well as the many professional themes included with Studio for WPF. Synchronize Scheduler to a calendar control like Calendar to select a specific date or date range. Scheduler can display any number of dates selected.